It’s a common refrain for everyone: “I need to eat better!” Americans are notorious for having horrible diets, mostly made up of high fat, high sugar, and highly processed foods. We’re a culture of fast food, and I don’t just mean McDonald’s. We eat out a lot and generally speaking, the carb and dairy heavy pasta dish is actually cheaper than the veggie laden salad dish. There are a few handy-dandy ways to get more veggies into every meal of the day though. Whether eating in or out, you can definitely make more vegetable centered meals a staple in your diet. Using vegetables that are usually for dinner, like broccoli or cauliflower, in your breakfast is a great way to ensure you’ll use all the produce without it going bad too. Totally a frugal score! Here are some ideas to help you get started. Eggs and veggies- Eggs are an incredibly diverse food and a breakfast staple. All sorts of veggies can go in your scrambled eggs or your omelette. Spinach, tomatoes, onions, broccoli, avocado…basically, any vegetable you like can be tossed in your eggs. Try something like this: eggs scrambled with spinach and red peppers with a side of whole wheat toast covered with peanut butter. It’s delicious and packed with nutrients! A breakfast like that will keep you full until midday as well. Veggie Breakfast Sandwich- Toss out that old bacon, egg and cheese and upgrade your morning sandwich. Try this instead: on a whole wheat bagel or toast, layer a tomato slice, spinach leaves, avocado and an egg. Bam! You’ve lowered your cholesterol intake and upped your veggies. A salad is a great way to jam pack your lunch with veggies. Just make sure it’s the right kind of salad. Pass on iceberg or romaine lettuce and opt instead for nutrient dense greens like kale, collard greens, spinach or mixed greens. (That alone will totally up your vitamin intake!) Skip the croutons and cheese crumbles too. Instead add nuts like almonds or walnuts for a delicious crunch and protein boost, or raisins for a touch of sweet. It’s summer, so grilled veggies are a great salad addition. Same goes for things like berries. How does this salad sound: carrots, almonds, strawberries, yellow peppers and cucumbers. Light, refreshing and healthy! Perfect for a hot summer afternoon. For a more substantial lunch, try grilled chicken, tomatoes, corn and black beans on a bed of spinach. It’s got protein out the wazoo and a nice dose of iron! A favorite meal for most people is the traditional Italian one- pasta, garlic bread, meatballs. You can actually make an all vegetable version of that! Using veggies like zucchini or spaghetti squash you can make veggie noodles. A tomato sauce rich with garlic and onions has added veggies to it. Skip the meatballs or try making them with tofu or tempeh. Another easy and veggie heavy is a stir-fry. You can put literally anything in there too. Whatever veggies you have, throw them into a skillet with some oil and watch a meal appear! I like to do mushrooms, carrots, snow peas, broccoli and chick peas. Sometimes I put the medley over brown rice or add a protein like chicken or tofu. Sometimes I just eat the veggies! You can add whatever sauce you like to your stir fry for a punch of flavor. One meal I love to make for date night at home is roasted vegetables with fish. (Roasting things makes me feel like more of a cook than just sauteeing things does.) I like to do a sweet potato, broccoli and cauliflower medley. The potatoes go in first, with some salt and pepper and I add the greens a little later. I blacken some tilapia with a pre-made cajun spice mix (straight from the grocery store!) and bake the fish in the oven too. At the end, I have a hearty and healthy meal that all came out of the oven. Roasted asparagus is also good with fish! Next time you’re in the kitchen and reaching for a meal that is veggie-less, ask yourself how you can add something colorful in there. Layer eggplant into your lasagna! Add a side salad to meat and potatoes! Have carrots instead of goldfish for a snack! 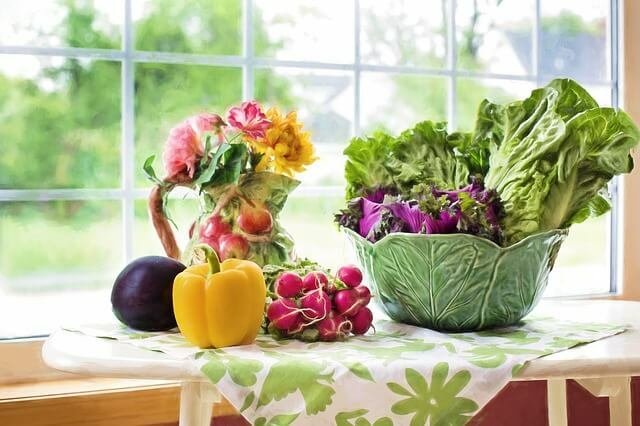 Vegetables are also cheaper than prepared foods or meats. There are a million ways to get those veggies into your diet and you’ll be surprised at how easy it really is. Do you get enough veggies in your diet? What are some other ways you sneak them in?